Household hazardous waste depots help the environment - you can too! What is household hazardous waste? It’s simple! If it’s corrosive, flammable, or poisonous it’s hazardous waste. Some examples of every day household products we use include oven and window cleaners, fluorescent bulbs, and pool chemicals. It is important that these products never be poured down the drain or put out with your regular garbage, as they will contaminate water and landfills. 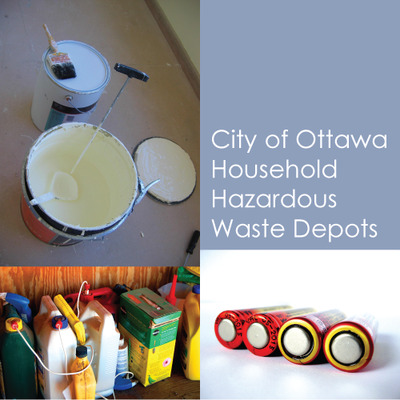 As a resident of the City of Ottawa, you can dispose of these products safely at the Household Hazardous Waste Depots offered one day of the month at various City of Ottawa locations. The 2013 dates and locations are listed below. For a complete listing of acceptable household hazardous waste, please visit www.ottawa.ca. Environmentally friendly and safer alternatives are available for household cleaning, home improvement and garden care. If you must purchase a hazardous product, but only the amount you can use up. Avoid larger quantity, bulk purchases if you don’t need a lot. Ensure that the product you purchase does what you want it to do before you purchase it. Once purchased, follow the instructions on the label for safe use, ventilation and storage. Relatives, friends, neighbors, community groups and charitable organizations may be able to use of your leftovers. Much of the aerosol product ends up in the air. Purchase safer alternatives. In 2012, Statistics Canada conducted a survey of the dispose of household hazardous waste, by province. One of the most common hazardous household products focused on was leftover paint or solvents. Statistics Canada reported Ontario as one of the provinces where over 50% residents took or sent the leftover paint or solvents to a depot or drop-off centre, precisely 63%. Only 4% of residents had put them in the garbage, 5% had returned them to a supplier or retailer, and 34% still had them sitting somewhere in the house or garage. It is great to see majority of Ontarian’s properly disposing of leftover paint and solvent however; to the 34% of residents who still have paint sitting around at home, it is important to know about the expiration of paint. Professional painters claim that depending on how it is stored, paint can on average last up to two years after being opened. Paint cannot be stored in extreme temperatures such as extremely hot, or frigid cold weather. It is best to keep paint located in a climate where a medium temperature is reached and does not fluctuate. With that being said, it is important to remember that yes, paint does expire after an average of two years if stored properly. For more statistics on household hazardous waste by province in Canada, please visit www.statcan.gc.ca. Residential electronic waste is also accepted at this site. 2705 Stevenage Drive, between Hawthorne Road and Russell Road, south of Walkley Road. Spring cleaning season is upon us. The City of Ottawa would like to encourage you to dispose of your waste in safest and most environmentally friendly way. There are a number of options available for the disposal of household hazardous waste.